I loved Chameleon Moon so much, and I think it would hold a strong appeal for fans of Welcome to Night Vale. Patrol is a true dystopian – a city where the sky is chocked with smoke and ash and the ground is just one step away from crumbling into the fires below. And above everything the helicopters of Eye in the Sky survey the super powered citizens, making sure no one can escape. But within this hellhole, the citizens of Patrol have found love, families, and the will to resist. Among them is Evelyn Calliope, a singer with a sonic voice who is the heroine that Patrol needs. But in the beginning of Chameleon Moon, our main window into the world of Patrol is Regan, a lizard like man with the power to become invisible. Regan’s looking for an escape from Patrol, and a ghostly boy named Hans claims to be able to provide it. But when Regan balks at Hans’s stipulation – murder – Hans takes his memory, leaving Regan with no idea who he is or how Patrol functions. Luckily for him, it isn’t long before he finds help from Evelyn. Chameleon Moon is wonderfully, fabulously diverse, with a cast that’s particularly impressive from a queer representation stand point. A large part of the cast is people of color, many of them have disabilities, and I’d say the vast majority are queer. Like, our protagonists are an asexual man with anxiety issues and a transgender superheroine in a polyamorus marriage with two other women. You have no idea how excited I was that Regan is asexual. And it’s even discussed on page! And it’s asexual representation from an ace spectrum author. This makes me so so happy. Oh, and it took me an embarrassing length of time to realize that Regan’s an asexual character with invisibility powers. The invisible asexual. How did I not get this sooner? I honestly love these characters so much. I can’t chose a favorite, it’s just too hard. I relate to Regan in a way that I usually don’t. He’s asexual and has anxiety issues, aspects of myself that I rarely see reflected in the fiction I read, much less in the protagonists. But Evelyn is so awesome and badass but kind and caring too… And how can I forget Zilch, the nonbinary zombie who’s a total sweetie? I love them so much too. Don’t you see why I can’t choose a favorite? It’s impossible. This cast is just way too lovable. The greatest strength of Chameleon Moon is the characters. Patrol is one of the most oppressive, depressing dystopians I’ve ever read about, but Chameleon Moon is yet weirdly optimistic. As terrible as everything is, this is a series about love, friendship, and family. It’s about people working together to make their lives better without throwing anyone else under the bus to do so. But even beyond the characters, there’s so much to love about Chameleon Moon. For one thing, the setting is just so original and inventive. Patrol is a cipher, and while I gradually got to know more and more about it over the course of the story, I think there’s still a lot more to be explored. But I won’t say too much, because the unfolding mystery of Patrol and it’s supernatural residents is not to be missed. Oh, and the super powers also felt incredibly imaginative. In particular, I loved Rose’s control over plants and how she found such a wide variety of uses for it. And Danae’s ability to bring metal to life was also pretty awesome, particularly how she used it to make prosthetics. 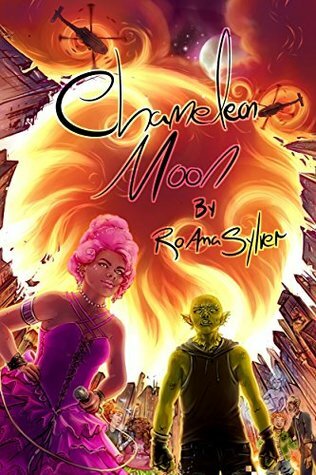 Chameleon Moon is more character focused than plot focused, and I think that led to it having a slower pace than you might normally find for dystopian or superhero books. I liked this book a lot, but it actually took me a while to read, longer than I would have expected based on its length. While I don’t want to give to much away plot wise, I do want to say that I loved how amnesia is used. I don’t think I’ve ever read a book where the character gets amnesia during the story. Although it came fairly soon into the book, it had the result of me knowing more about Regan than he did about himself, which had some delicious results. Chameleon Moon is a well written, imaginative book filled with characters I adore. Is it any surprise that I can’t wait for book two? Oo, question: I often try not to read books in serieses until the full series has been released. Does this one feel relatively self-contained, or does it depend heavily on what happens in the future book(s)? Hmm. I would say it’s got a distinct ending point, but that you’ll probably need to read the sequels to get everything. Think of it as like the first Star Wars movie, A New Hope.